Its finished! I’m so happy with how it turned out. I couldn’t decide how to quilt it (Thank you for all your great ideas!) but I finally decided to do straight quilting in a grid pattern around the seams. It looks more boy-ish, and really makes each square pop. It took awhile, but after quilting 124 straight lines I’m still really glad that I did it myself, on my machine. There’s a sense of pride that comes with finishing a quilt all by yourself from start to finish, I’m sure all of you that quilt yourself know what I’m talking about don’t you? I pieced a strip through the back so this could be reversible when I want something simple. And so I can turn it over when needed, since this will be on my 2 year old’s bed…..yikes. You did such a great job! I still can’t believe that you’re new to quilting-you have a ton of talent :) I didn’t know your sis had a baby?!!! Congrat Auntie! I’m working on two lap quilts for gifts but can’t wait to finish to do something bigger…you have been such an inspiration! Thanks! beautimous. ;) i really like the back of it too. the straight lines look awesome. way to go! 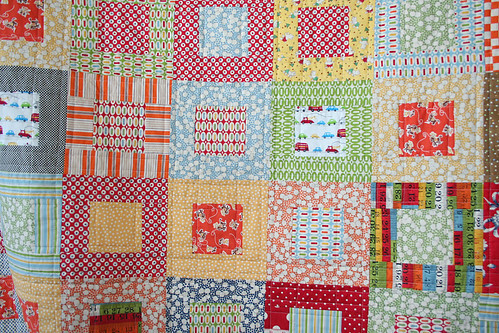 The quilt lis beautiful. Nice job. This looks wonderful! I have only ever done my own quilting, on my dinky machine, so yes i know the great sense of accomplishment in finishing! I just found your blog and am so glad I did! 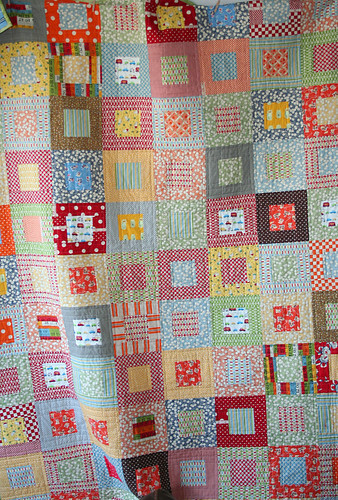 You make really nice quilts that inspire me to make fun quilts. I look forward to seeing more of your creation! Oh it’s so beautiful! Wonderful job!! And I know just want you mean about quilting your own quilts. So nice to make the whole thing from start to finish! This is one of my fav quilts of all time. What a treasure. I love everything about it. You should be VERY proud! I be, hittin dem twsisties and pwnin some duuudes digitally. I’m insanely jealous. It’s gorgeous! This is a great quilt…thanks for motivating me to make one…and to quilt it myself! It looks great!! I love the fabrics and the row on the back. Well done and thanks for sharing! This is fabulous and I love that stripe on the back! That is one fabulous quilt. Thanks for sharing. The detail is incredible!!! Ben’s quilt looks great! I love the squares and the backing! I am sure he loves it too right? 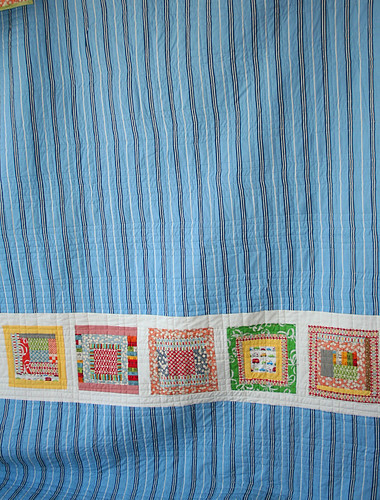 It is a beautiful quilt – great fabric, great quilting idea. very nice. It is such a happy quilt. great job. btw loving your blog, I just recently found it and it is so inspiring. what a beautiful quilt! your little guy will LOVE it i’m sure. its giving me the quiliting itch again! It did turn out very boy-ish and cute! I love the reversible look, too, with very different “feels” on either side. It’s just so gorgeous. I keep coming back and sighing at it. Lucky boy!! Your son is a lucky little one…for his Mommy to make him something so special! I just love this quilt! Beautiful! That is a stunning quilt! You will love making his bed every morning with this one, that’s for sure. That is one of the most beautiful quilts I have ever seen! The grid quilting was just perfect. Love it! I love this quilt so much! I may have to add this pattern to my to do list. It is lovely and I love your matterial that you used. Oh wow! Love that! I've been looking for those fabrics but sadly, they seem out of stock.